Welcome to this section of our site. We are proud to announce the members of "TEAM FITCH". All of these people work hard and Race even Harder!! Drop by and say hi when you see any of these competitors at your local events! SUZUKI HAYBUSA SETS LAND SPEED RECORD USING FITCH FUEL CATALYST !! Congratulations to Fred Klies, of Eastern Cycle Performance, and Mike Sweeny for setting a new Land Speed record in the Altered Power Streamliner-Gas Class. Driving a Suzuki GSX 1300R Hayabusa, prepared by Mr. Klies, Mr. Sweeny bested the prior mark of 196.800 MPH by recording a speed of 201.798 MPH over a 1 mile run from a standing start. Before I started using the Fitch Fuel Catalyst the car ran pretty good but kind of flat. After installing the product the car not only ran cleaner but it was a lot crisper and better engine power when braking and coming out of the corners. This product changed the life of my race car enough to win "Rookie of the Year"!! All I can say is BUY FITCH!! It could change your life! Here's Jeff at the Track!! Here's Jeff at the Drags!! Another big Fitch winner at the US Nationals was Schnitz Performance and Team Kawasaki rider Ryan Schnitz. Ryan dominated the very tough heads-up 600 Super Sport class as he has done all year with another win. Ryan is currently 1st in the points and holds the records for the 600 SS Class. Fellow Team Kawasaki rider Jim Carrol squeezed by Ryan in the Formula Superbike Class where Ryan took runner up. Schnitz Performance has recently come on board as a Fitch Fuel Catalyst dealer and is the supplier of Fitch at all the ProStar races. Visit their both on Manufactures row. PM Cycles Ltd. is proud to join Kawasaki, Speed Pro, PJ's Recreational, Motovan and Autolite as a sponsor for "2 Time 125 Pro Champion", Blain Prest in his endeavor to be the best. 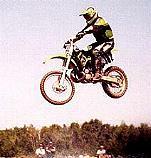 Blain has 20 years experience in Moto Cross racing and strives ever harder to achieve his goals. With only 2 more races remaining this season for Pro Star motorcycle drag racing, Marcus Oliver and his funny bike team, dominated qualifying and took the #1 spot at the US Nationals in Atco NJ. In qualifying, Marcus rode a 600 HP turbo alcohol funny bike to an impressive 4.32 at 169 MPH at this 1/8 mile race. He was over a 1/10 faster than the next fastest competitor. Putting this much power to the ground and keeping traction is no easy job. Marcus had a little to much tire spin and had to settle for 2nd place as Team Kawasaki rider Chip Ellis just inched passed Marcus by a few thousands of a second in one of the closest funny bike races ever as both riders clicked off a 4.47. PM Cycles Ltd. is proud to have Mike as part of Team Fitch for the 2002 season. 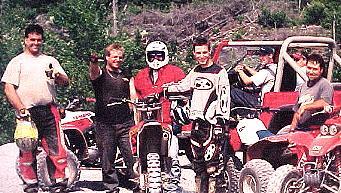 Mike says..."We are looking forward to a full season of racing in 2002 with the Fitch Team!!" ONE OF OUR OWN WINS !! One of Advanced Power Systems own sales/tech personnel and "Team Fitch Racer" Shane Murphy, won the Street ET series of the MCD event held at the Prostar US Nationals in Atco NJ. Shane tool his Honda RC51 through 4 rounds of competition for the win in only his 2nd MDC race this year. He was also runner up in Street ET 6 weeks before at the previous MDC race at LVD in West Lebanon NY. With 2 more MDC races lefft this year, Shane has a shot of winning the season championship if he continues this streak. His last full season of competition with MDC was in 1997 in which he won the Super Street season championship. Shane has 7 years of drag racing experience under his belt and with the support from Fitch, we should expect to see him in the winners circle again. Ray Cox Jr. drives the #55 car in this series. His 1999 Monty Carlo is a regular on the circut. This year Ray finished 7th in the points. Ray says "we are looking forward to the 2002 season of racing with the Fitch Fuel Catalyst. Get it...it works !! See you at the track. Here's Ray at the Races!! In other motorcycle competition,XSBA (Xtreme Sport Bike Assoc) held it's 2nd annual Pocono Invitational at Pocono Raceway. XSBA competition is a stunt competition for street bike riders which draws the best talents in the country. Sporting their Fitch Fuel Catalyst stickers on their bikes, Connecticut stunt crew, Caped Crusaders, consisting of Jeff Bascetta, Carmello Vasile, and Matt Parsons were incited to compete. XSBA judges picked the top 8 riders to compete in the Sunday show at the Formula USA race. Although the Caped Crusaders did not make the final cut (there were over 100 entries), they did put on quite a show displaying their wide range of wheelies, burnouts, and acrobatic stunts. These riders regularly put shows on at LVD in West lebanon where the majority of the Fitch Fuel Catalyst Drag racing Series events also take place. DARREN LEONARD, MINI STOCK RACER #69, HONDA. Darren's year has been good, except with some normal racing blues late in the season. We are happy to have sponserd him this past year late in the season and are looking forward to the full 2002 season having him run in this class. Hammer down Darren and keep on Fitchin !!! "We are a private race program that has made substantial improvements to our program this year with thanks to sponsered support by companies like the Fitch Fuel Catalyst. Companies like the Fitch make it possible for us to run with the Big Dogs like Team Kawasaki." Oliver has Fitch Fuel Catalyst in the fuel cell of his funny bike, Harvey uses it in his Formula Superbike and they also have Fitch installed on their race program motorhome which they use to travel to the races. If vintage racing is your thing then Chris is the man. racing his beautiful antique bikes on the east coast of Canada. He and his wife take these beauties, and many more of his collection, out to race on a regular basis. Chris says "I do believe this product is working, so much so that I have purchased an additional unit for the Vincent Sidecar Racer. " Stop and and say hi when you see him in your area. The Chi-Town Hustlers motorcycle racing team has been having a great 2002 season. All five or our riders have recorded numerous trophy-winning finishes. As this season moves into the home stretch, rider Dave Vaughn is leading in points in four regional championships, while his teammate "K3" Chris Onwiler is leading another five!! The team uses the Fitch Fuel Catalyst in all of our race bikes, as well as in our fuel storage cans. Prior to using Fitch, the team had experienced regular problems with fuel evaporating out of the motorcycle's carborators and becoming clogged with gummy deposits, requiring them to be torn down and cleaned at the racetrack. After a long tow, there would be a sense of dread as we tried to start each bike. In spite of the hot extra weather in the Midwest this year, this evaporation problem has only occurred once all season. When we primmed the bike's carborators, it started immediately and ran perfectly. What a relief!. This has proved to us that the Fitch really does prevent fuel deposits from forming. Fitch also claims that their treatment increases horsepower and torque. We intend to do some dyno work to see for ourselves, but this much is for sure, our bikes are fast, and they are winning! FITCH FUEL CATALYST JOINS PROSTAR !! Advanced Power Systems is proud to announce that they are now a participant in the Contingency Sponser Program for the AMA Prostar Drag Racing Series. The Fitch keeps all fuels fresh including VP, Sunoc and Nutec in spec. All racing fuels experience oxygen and bacteria attack causing the fuel to degrade or become contaminated. This can be attributed to humidity, temperature, mixing of fuels or simply because fuel sits around in the fuel jugs or tanks for more than 24 hours. Competitors alway make sure the electronics and mechanics of their bikes are set for peak performance. Why not ensure the ultimate performance from the fuel? Don't leave it to chance when the quality of the fuel could mean the difference between 1st and 2nd place. Take the variables out of the fuel by dropping the Fitch Fuel Catalyst into your fuel jug or tank.